a wedding & a werewolf. | there's no place like gnome. a wedding & a werewolf. The day had arrived. Friends Krissy and Matt were to be married and I was the one doing the ceremony. It was my first official wedding I had officiated and the first time I’d ever signed a marriage license. It was a full day leading up to the wedding at 6pm. We had rehearsal in the backyard of Krissy’s parent’s house [where the wedding would take place – a beautiful yard with a pond] in the late morning and from that point on, it seemed I was on child duty. There were seven [yes. seven.] children under the age of eight in the ceremony and they needed lunch, naps, tuxes, and guidance for pictures. There is just something about small short children in tuxes – they look like such little men. Oh for cute. The wedding began only a few minutes late, complicated by a processional song that was not quite the one the bride had picked out and a few issues with the aisle runner. Krissy and Matt stood before me and in front of one hundred family and friends who had gathered for the occasion. Things were going well. 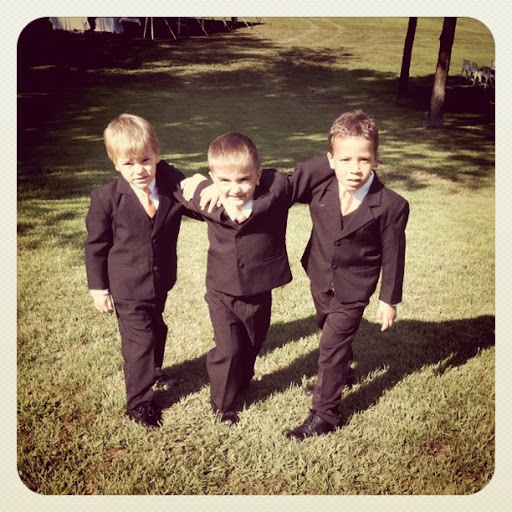 Except one of the bride’s sons walked up the aisle with a major attitude attached. I’m not sure what had happened and I was too focused on Krissy and Matt to see what he was doing during the ceremony. Crouched on the ground between the best man and the groom, he dug in the dirt with a stick and apparently, at one point, shoved grass down his brother’s shirt. There was something more about dirt and throwing. It didn’t much matter because, as if that didn’t distract the bride and groom and assembly enough, there was more. 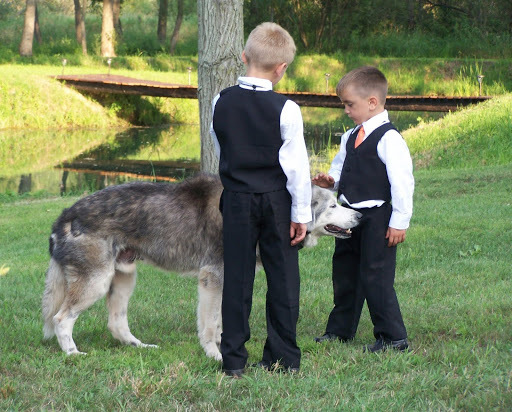 Right around the time of the vows and rings, a mangy old Husky dog wandered into the ceremony and right up to where the bridal party stood. This thrilled the children who were standing up front – they went right to petting the questionable dog and scratching his stomach. I see this happening – as does everyone else present – and I can’t hold it together. There’s a flippin’ dog to my left who just appeared and is now enjoying the attention. And I’m almost worried the dog might hurt the kids. What do I do?! I stare at my papers and try to focus. Laughter exploded once more when Evan, always a Twilight fan [thanks to his mother’s influence], asks, in reference to the dog, “Is it a werewolf? !” I can’t even look at the bride and the groom because they are stifling laughter. This was a point when ad-libbing and throwing a joke in would be good – but I’m just horrid on my feet. Something to learn and grow. But the wedding happened, surprise guest and all. [It’s a neighbor’s dog, I guess. He heard the party happening and wanted to see what was up.] The wedding happened, Krissy and Matt are legally married, and the reception was fun. 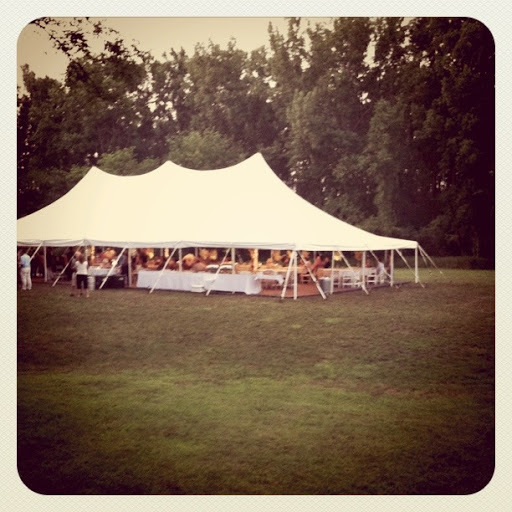 The dinner and dance was held in a tent right next to where we had the ceremony. I’ll admit I was skeptical when she said they were having their reception in a tent but it was an awesome tent. A Harry Potter tent, as Allen would call it. There was dancing, a fireworks display, and bubble blowing. The combination of champagne and the bouncy house only caused one bridesmaid to get sick. [Just one! Victory.] A party rock anthem, sweet caroline, and both nsync and lady gaga. I had a great time with Banana Lynn and Kyle, Allen, Timmy, and David – friends I don’t see all too often. I am never opposed to the attention and affection my protective male friends from high school give me including dances aplenty, a “lover’s stroll” around the pond [with five others], and a few “sweetheart” and “darling” pet names; it was good and fun and I love them all. Next Banana wedding: Lynn and Kyle’s in September. This is one where I’m joining pastoral forces with another pastor and will be delivering the message. Wooten! Can’t wait!